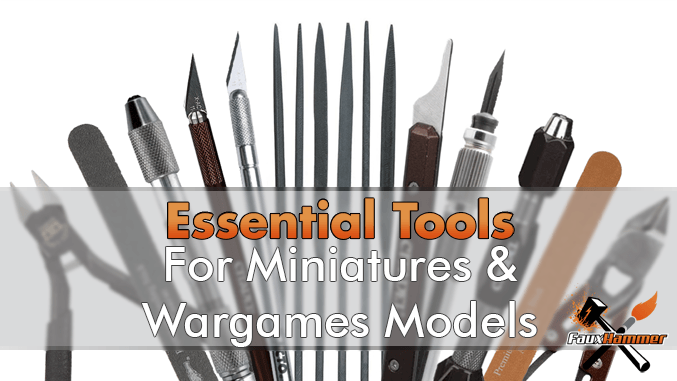 I’ve been wanting to summarise the Essential Hobby Tools for Miniatures & Wargames Models for quite some time. It’s rather obvious what many of them are, but I’ve had some difficulty defining the structure in a way which is suitable to the various types of hobbyist and myriad of skill levels out there. Below I’ve summarised the list based on the order you are likely to pick your equipment up. In regard to skill level, I’ve summarised the various options within the sections below. The items below are the absolute, necessary components you need in your kit. As a complete beginner, they are the items you “must” buy first before you can even get started. For anyone stepping up in skill level, these are the items you want to upgrade first. There are literally 2 things you simply cannot paint without, Paints and Brushes. Click the image above to see our breakdown of the best brushes you can buy. Put Simply, as a beginner, your Games Workshop or Army Painter brushes will do the job. With their unique shapes made for specific tasks, they do a lot of the work for you. When you are stepping up in skill, you want to aim for a natural hair Sable Brush set. Rosemary & Co offer some incredible brushes with their Series 22/33, arguably on par with the more Popular Winsor & Newton Series 7 (at only a third the price). The most Critically Acclaimed brushes, however, are Raphael’s 8404 series. Even though they are not as popular as Winsor & Newton or Rosemary & Co. I’m yet to see a bad word said about them. There are various brands. 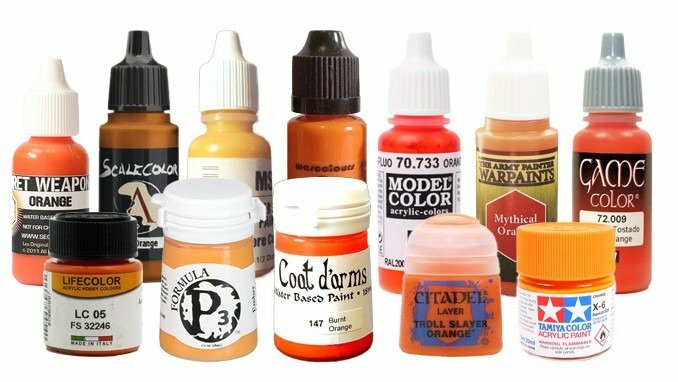 Games Workshop’s Citadel paint range is by part the most popular and great for the beginner, especially as Games Workshop provide a slew of Tutorial videos showing how to use these paints, you just need to get the paints and copy. 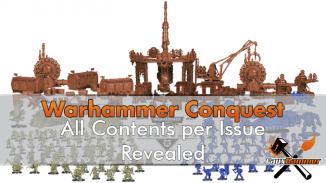 Other ranges such as Army Painter and Privateer Press are also great considerations. The most lauded range is Vallejo who provide various series of Miniature paints or Airbrush Equivalents. With the exception of the few push fit models available, almost all miniature components will need to be glued together before, during or after painting them. For Plastic Miniatures, you need should really use plastic glue. Super Glue will work with any kind of miniature so if you have a mix of plastic, resin and metal, just get some Super Glue as your first glue as it will work with anything. Specifically for plastic miniatures, plastic glue is applied to both parts which are to be stuck together. This will melt the plastic slightly which will cause them to essentially fuse themselves. 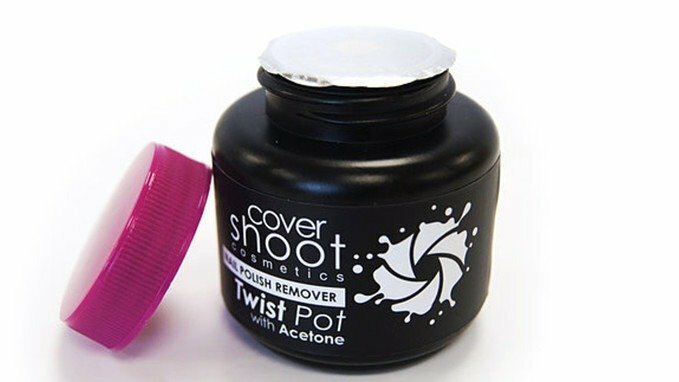 You can spend the earth on Games Workshop’s plastic glue which has the strangest (in my humble opinion), yet a rather common applicator spout. 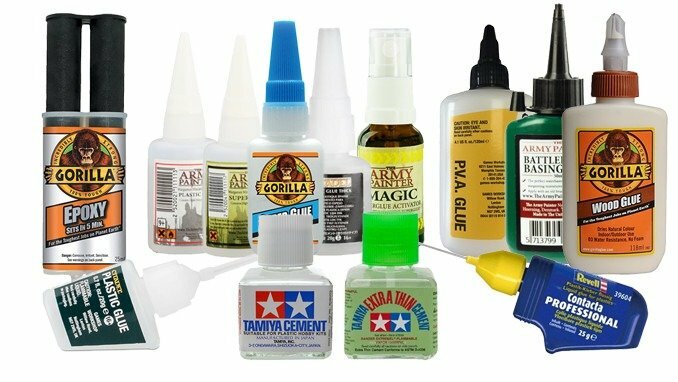 Or you can pick up any other solvent based plastic glue you like. The Tamiya Extra Thin Cement is a more favourable option as it has an equivalent price and comes with a thin brush in the lid for applying it. It does, however, dry out pretty fast as it’s so thin. Some say you should dry-fit your piece and run this down the seam. Metal or resin Miniatures require a type of superglue, this comes in many forms but the general 2 are liquid and gel. With the liquid version being quite runny it is used for small components. the gel is thicker and is best used for larger pieces. Finally, you can use Epoxy or Resin as a bonding material. This can be used to create a particular effect or if you want something which will create an excessively strong bond whilst filling large gaps. Most of the time these are 2 part materials and need to be mixed together before you apply them. they have a working time of about 10 minutes anhttps://www.amazon.co.uk/s?k=model+primer&ref=nb_sb_noss_1d create some of the strongest bonds possible. There are numerous hobby knife sets you can pick up with blades of all different sizes and shapes. But the defacto knife is the x-acto knife. 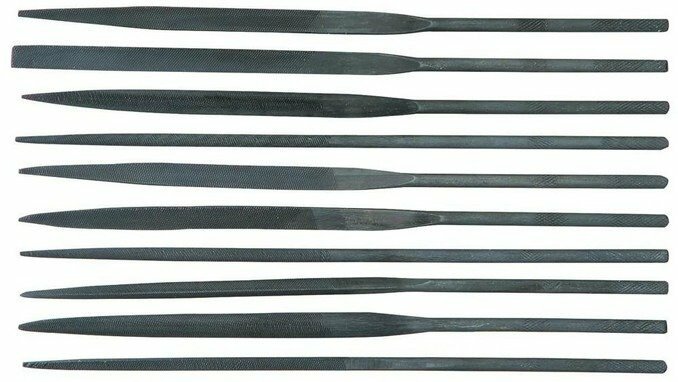 A hobby knife is the most necessary of all your cutting instruments, In later sections you will also come across sprue clippers and mould line removers. At its simplist level, the hobby knife can achieve all of thise tasks. You only need 1 handle (I’ve had the same one for over 20 years) and simply replace the blades when you need to. This is used for many things, such as trimming the excess sprue parts from your model pieces and cutting out water slide transfers. It can also be used for removing mould lines. However, unless you have a feathery touch, you can end up taking away more plastic than you expect them to. This is whay it;s often better to get a specific mould line removal tool. Kind of a given, but certainly worth mentioning. You need some kind of water receptacle. As a beginner, you can use some old plastic cups or empty noodle pots. When you become a “professional painter” you will want to step up to some old mugs! You could even get some branded mugs. Just make sure you have a way to differentiate them from the ones you use for hot drinks. Many of us have made the mistake of drinking a brush in a drink. Fewer, but still some, have even drunk their paint water. 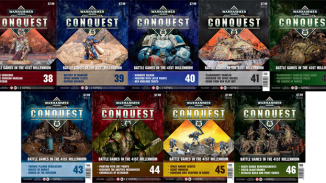 There are several Water Pot products on the market that you can buy, and looking specifically at Games Workshop’s offering. It’s better and cheaper than their mugs and most other options. When it comes to Water pots, you will want at least 2. one for normal paints and one for metallics. Personally, I use 3, the third one in a final rinse and also to take clean water for thinning paints. The below tools are for when you want to transition from a complete beginner and each, in turn, will either improve your modelling or hobbying skill or just make your life a lot easier. I ‘m going to get a lot of stick or not putting Primer is the Required Tools section, but I have seen many incredible painters who paint without using a primer. I will stand by Primer, not being “required” as it is simply not “required”, you can paint without it. But I promise you that this is the most important, unnecessary tool you can buy. Whilst, like paint, this is more of a consumable than a tool, primer is not actually essential, but it certainly helps. Especially if your miniatures are to be used for battle (in games). Primers help create a surface which binds to the model stronger than bare paint, in many cases creates a surface which the paint will better adhere to. Too much primer will cause runs and clog the details of your model. I’ve seen some mind-blowing painters who do not use primer at all. (these are for display only, not for use in wargames). 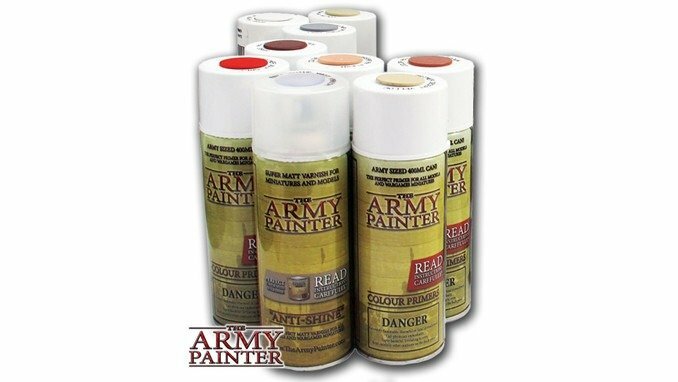 Most companies who produce Miniatures and Wargames Model Paints will also create Rattle-Can Spray Primers in various colours. 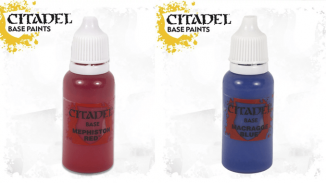 Games Workshop’s Citadel range is well known and you can also pick up Primers from Army painter & Privateer Press. You can opt (if you don’t want to pay for the Miniature brand name cans) to pick up any plastic primer from the likes of Rustoleum or Krylon for half the price or less. These also come in a range of colours. My personal preference, however, is Airbrush primer. It does not adhere to the models as well as rattle-can primers but it does leave a much smoother finish and clogs less detail. This also comes in a variety of colours from brands such as Vallejo and Badger’s Stynylrez. Like with primer, palette’s are not “required”, but if you are painting straight from the pot you simply won’t be able to get a good finish. 99 times out of 100 – probably more than that, your paint will be far too thick to paint smooth layers. Get some kind of a palette where you can put your paint and thin it with water. Anything with a smooth clean surface will work. 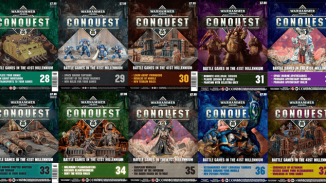 Games Workshop sells booklets of semi-gloss paper which can be used as palettes but are consumable items you need to rebuy. For years, I used an old, non-textured ceramic tile which I would clean off with Isopropyl Alcohol. 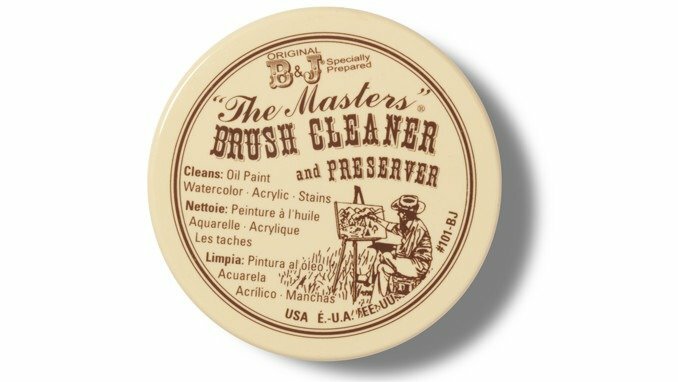 You can buy any old plastic artists palettes online which will do the job, but will also need to be cleaned off to keep the smooth surface. The best option is using a wet palette. This is a palette with foam or tissue that you keep wet. Then a layer of semipermeable paper on top of this. It stops your paint from drying out. You can easily make your own using some Tupperware, a sponge and some baking parchment. or you can buy them online. 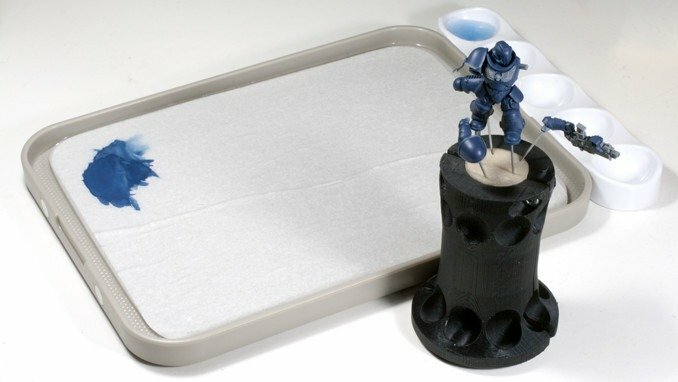 The one that is made for and dedicated to Miniature painting the Redgrass Games Wet Palette (shown above) which is favoured by many miniature painters. Use brings about wear, tear, and rust, A good worker takes good care of their tools and it’s no different here. Keep things like knives, clippers and other metal tools free of rust. You also need to keep your brushes free of paint. at least when you aren’t using them anyway. You may think that rinsing your brushes in clean water is cleaning them, One use of a brush soap will show you, it isn’t. 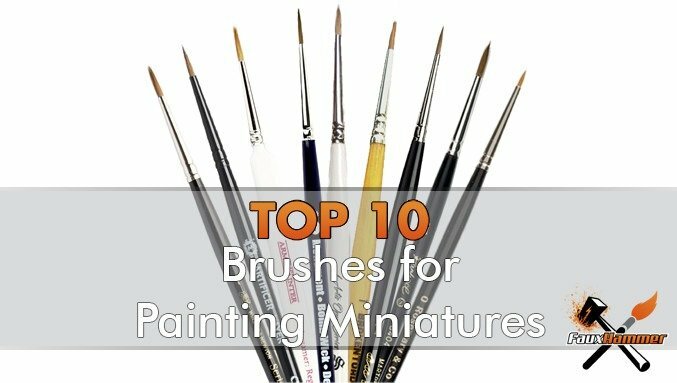 If you’re using cheap brushes like Games Workshop or generic Hobby Store brands this will greatly extend the life and condition of those brushes. If you are using high-end sable hair brushes, Brush soap is a necessity. 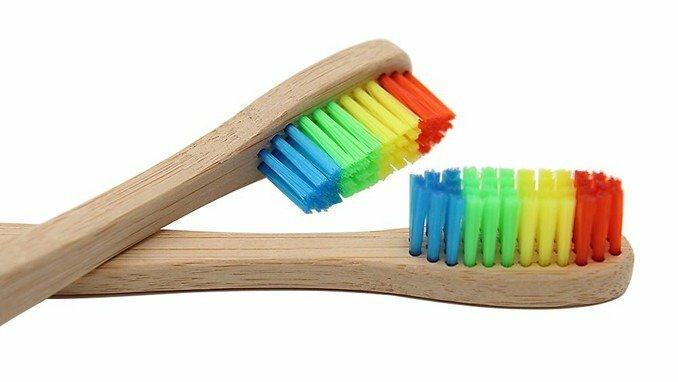 Once you think you’ve rinsed your brush, run it through some brush soap and massage it through the bristles until it runs clean. Then you can finally rinse your brush and put it away. Quite a necessary piece of equipment. You can always remove models from sprues by flexing, ripping and tearing but this will leave chunks of plastic on your models or even worse, snap the parts. 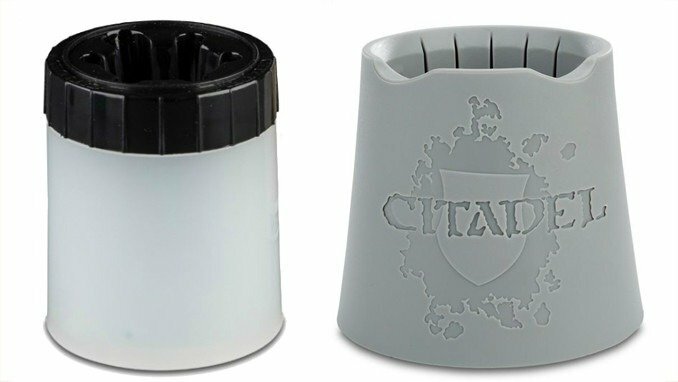 You can buy Games Workshop’s own Citadel Fine Detail Cutters or just pick up any fine cutters from a hardware store at a third of the price or even less. You just want something small with the flat edge and a long nose. There are some more professional options on the market such as the Xuron 2175ET (which I bought and don’t really have a very flush cutting edge) or the Tamiya Cutters which leave an incredibly straight cut (for a price). You can pick up tweezers anywhere for next to nothing, however, these options are normally soft metals and you will find the nose bends, long before you can get a good grip. 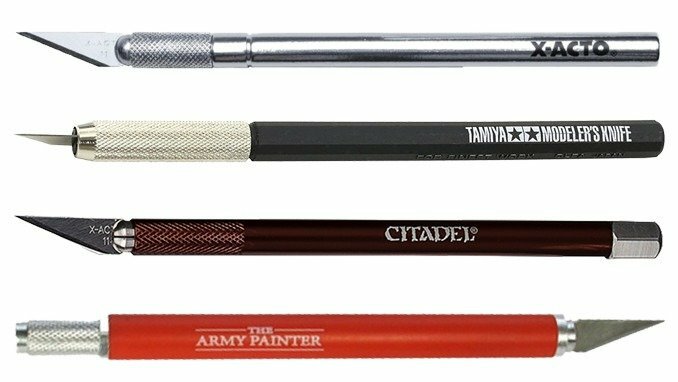 If you want to pay more money just for the sake of it, you can get some wargames branded tools, but you really are paying for the name. There’s nothing wrong with wanting all of your tools to look cool and have a similar aesthetic. 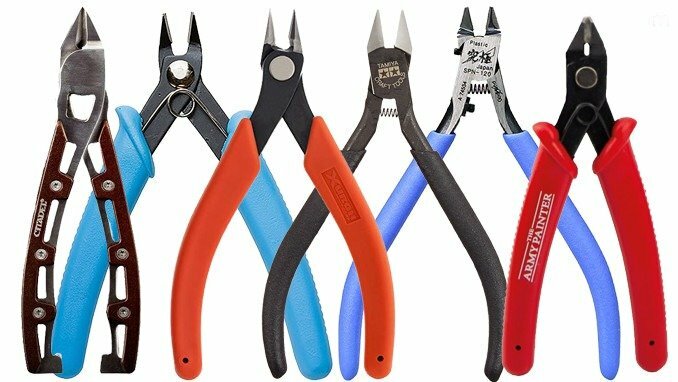 I do however suggest that if you are paying more for tools like tweezers you check out companies like Knippex or C.K Tools for some professional long-lasting kit used in Electronics. These items will last for years if not for your entire modelling career. 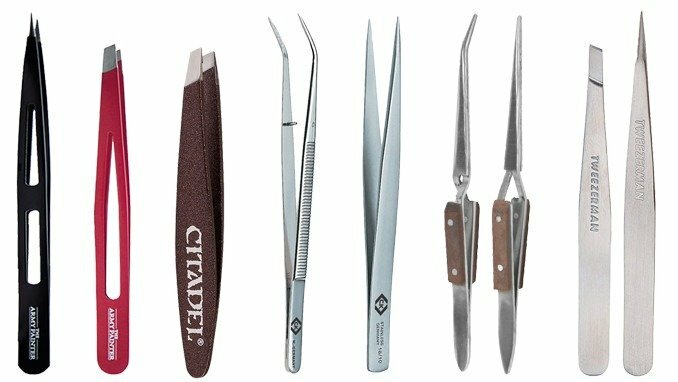 There are multiple types of tweezers you can pick up. There’s your grip type. You can get the more common ones that you hold closed. A much better option in most cases is the reverse of this where they are closed and you press to open them. These ones will keep a hold of the item until you press to let go. Much better for modelling. Then you need to look at the tip, most commonly you will want some long needle-nose or point-top tweezers for precision and a set of slant-tip tweezers (like the Citadel ones) for holding things like transfer paper. Finally, don’t underestimate the use of forceps, especially useful if you start to pin components for airbrushing. As you can clamp the pin to hold the item with enough distance to spray. An activity which marks the difference between a complete beginner and someone who has been in the hobby for a while is drilling out gun barrels. You will notice that most weapon gun barrels have the recesses formed in plastic. The actual barrel opening on the front of most weapons is rarely moulded in and it’s frequently none existent. Get a Pin Vice, to drill out those barrels in the very least and actually show the depth within them. Don’t believe me? Just post a picture somewhere online, of any model without the barrels drilled out and at least one person will hunt down that picture and shout “DRILL YOUR BARRELS!”. Another good use of a Pin Vice is drilling holes for pinning your components. Whether this is to securely attach weighty metal components and make sure the super glue holds, or just to put pins in to mount them to cork as you paint. There aren’t (as far as I’m aware) any highly recommended Pin Vice’s out there. Although I’ve seen a few with quick change drill bits. They look quite cool. Ok, so as I said, you can use hobby knife for removing mould lines. you just need to be careful as they are sharp enough to easily shave down a curved surface to a flat edge. A better option, specifically for this task is a mould line remover. Instead of a surgically sharp blade, a mould line remover, like Games Workshop’s Citadel Mould Line remover has a metal 90-degree edge which is just right for scraping the lines off. Taking off these lines will give a much better final look to your painted mini. You can always just search online for Mould Line remover for a cheaper alternative to Games Workshop’s product. A step up from this is a Seam Scraper. MicroMark is the most lauded brand. Although, this is only available in the US. A search for seam scraper online will find you some alternatives in other countries. A seam scraper is the best of both worlds between Hobby Knife and Mould Line remover. It tapers to a fine point to get into those hard to reach places unlike a mould line remover and it is not a surgically sharp blade like a hobby knife. Meaning it can remove those pesky lines without as much risk of flattening an edge. The necessity of this item is dependant on how much trouble you will get into by cutting into a tabletop. A self-healing cutting matt is a necessary component to protect your work surface. They are a basic and very cheap product to pick up and are really all dependant on the size you want. 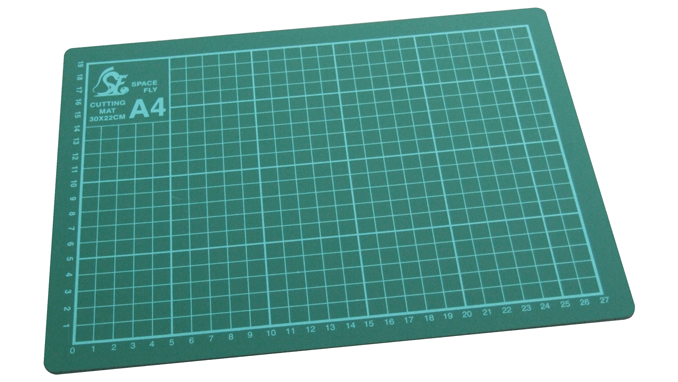 If you fancy something a bit more Snazzy, Games Workshop has the Citadel Cutting Mat. but any of the standard green or blue mats will work just fine. Sanding, even with sandpaper is really useful when working with miniatures. If you want to take your mould line removal to the next level or even clean up some of the edges where parts have been glued together and get a perfectly smooth join. There’s nothing better than sanding and polishing sticks. One of the more popular brands is Squadron. 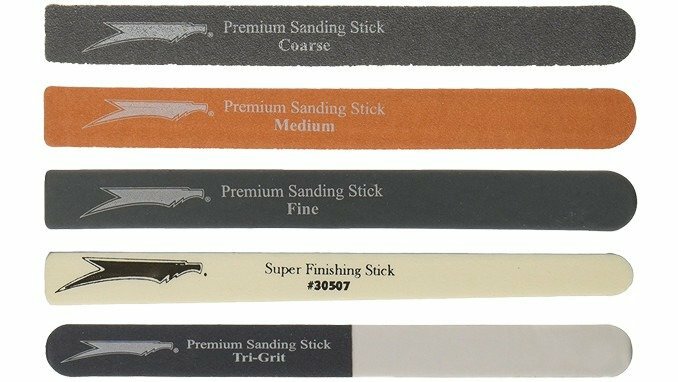 Which are great sanding sticks but the size of them makes them more useful for scale models than miniatures. 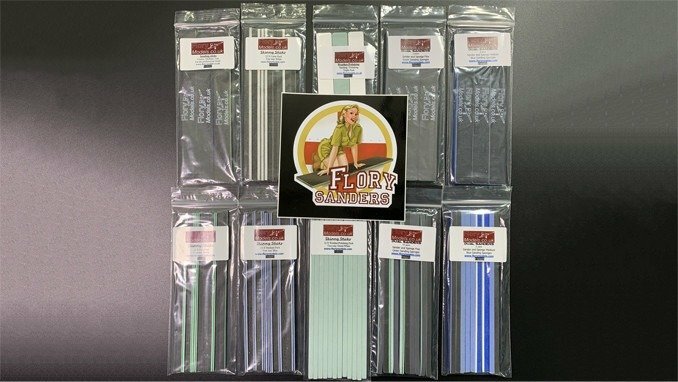 The better option (IMHO) is the flory mini sanding and polishing mini sticks from the UK (pictured above), which are exactly the size you need for miniatures. When working with resin or metal miniatures, sanding won’t get you very far. A better option for removing those nasty bumps and lines are modelling files. Honestly, you can pick up a full set of hobby files for next to nothing and these are perfect for the beginner. At an intermediate or advanced level, there are some specialist brands who do higher quality sets. But for the highest level, you want to be looking for a jewellers quality set. With good care and attention, these will last you a lifetime when working with softer metals like pewter. 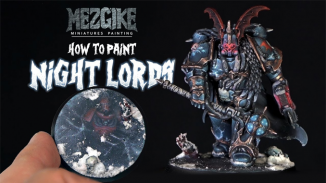 Good lighting really is a key requirement for painting, but it’s lower down on this list because no matter how many people tell you this it will always be one of the last things a hobbyist buys. You can start with natural daylight then a simple set-up with a couple (that’s right, a couple) of lamps. For a proper setup, you want to upgrade and to get some bright daylight bulbs. You can make your own light arch over your hobby space. 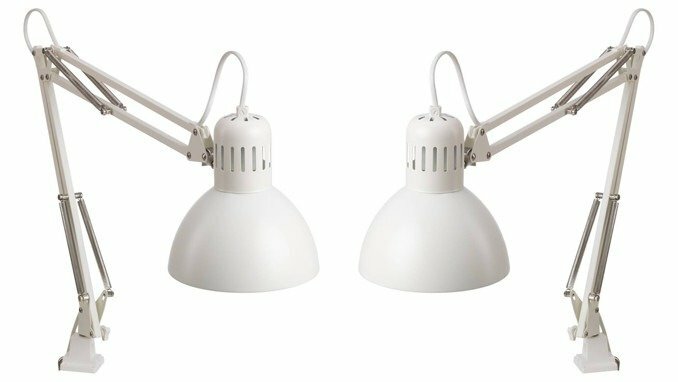 Finally, there are dedicated hobby lamps which offer the perfect lighting set-up. There are 2 main uses for a toothbrush in miniature painting. one is cleaning your miniatures with dish soap before priming. this is to make sure there’s no residual release agent on them from the mould removal process. This stuff can stop paint or primer from bonding to the model altogether. The other use is stripping paint off your miniatures. If you have a paint job but want to start again with a mini. then you can use isopropyl alcohol, a toothbrush and a little elbow grease will get that paint off a mini in no time. If you really want to go to the extra expense, an ultrasonic toothbrush will help too. Advanced tools are optional and only necessary for the true enthusiast hobbyists. Games Workshop has some of the most basic offerings, assuming you attach your mini to its base before painting. Then there are some others with unique features like the Redgrass Games RGG 360 handle. The Hobby Handle was a successfully kickstarted option that makes use of bottle caps. The most premium offering is the Rathcore holder which is a wooden, engraved handle with a riser bar, allowing a more stable grip whilst protecting the model from grubby fingers. 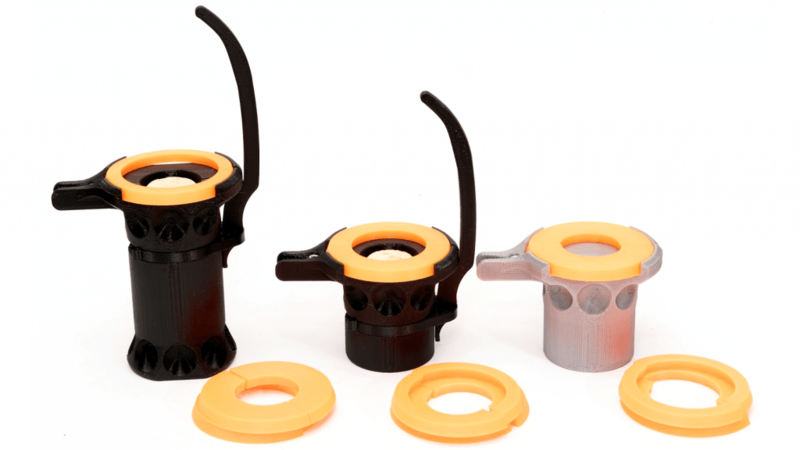 My favourite option, however, is Garfy’s get a Grip series, which holds based (up to 50mm) models or cork allowing you to attach parts using pins. This also has the added benefit of having a protective riser bar in the pro version. Also, it’s pretty cheap in comparison to its competitors. Using an airbrush is not an advanced technique, but it is certainly more of an advanced tool requiring maintenance a lot of peripheral items to go along with it. 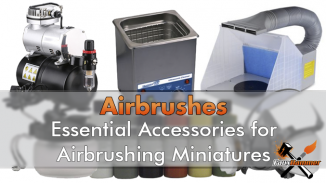 An airbrush set up is not difficult to get started with. Check out our guide for the best beginner airbrush where we show you the simplest kit you can buy to get you started. You just need a basic compressor with a tank, which you can get of Amazon or eBay. And that will come with a free basic airbrush. 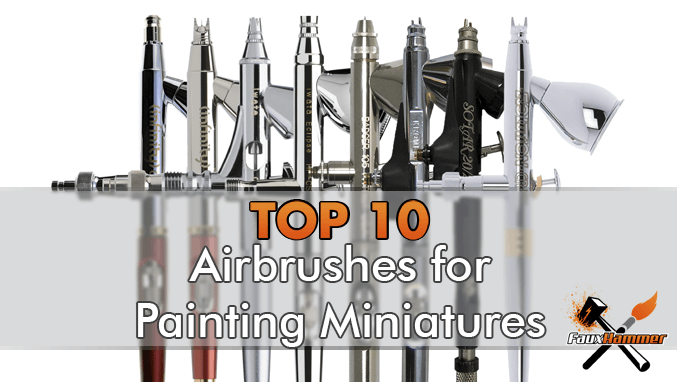 After that, check our guide for the best airbrush for miniatures (by clicking the Image above) and pick a low-cost workhorse for the intermediate level. 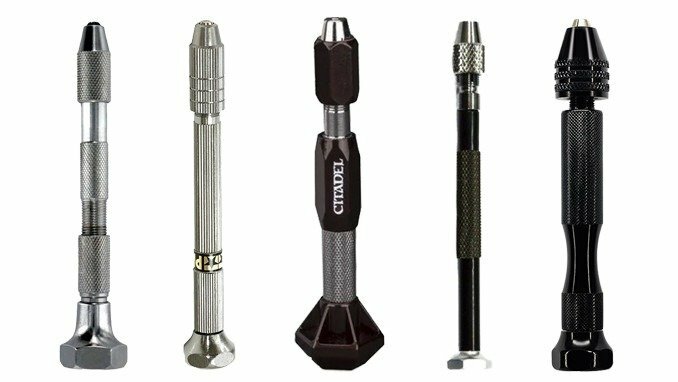 If you wish to step up, see the same list and choose one of the high-end airbrushes. Did you know that Static grass is meant to be statically charged before application? No? well, now you do. Static is meant to be applied with an applicator. The function of this is to pass an electrical charge through the static fibres immediately as it’s applied to wet glue. This is what takes your flock from looking unevenly spread across a base to actually standing upright. If you want to do grass bases, to make them look anywhere near realistic. you can’t get far without one of these. The deeper you delve into frequent painting, the more dispensible a method of quick-drying your paint. If you are display-painting you will need this between layers and equally so if you are batch painting. Give the mini’s a quick blast between coats so you know they are solid. this avoids you lifting partially dried paint which is the biggest cause of badly textured models. When you are finally ready for painting some of the finest lines, magnification helps, it’s not necessary, but it helps. There are multiple options here. 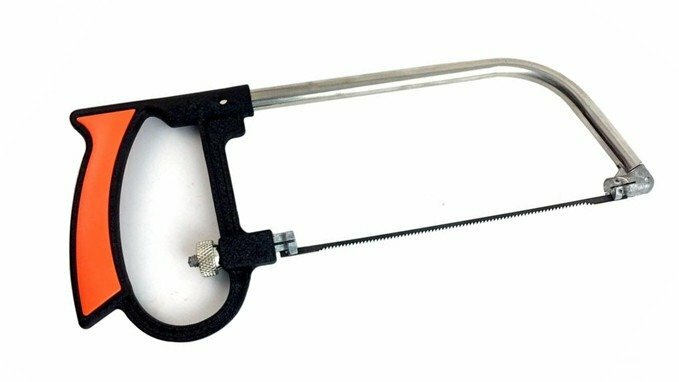 you can buy a simple magnification stand which will hold your parts and have a magnifying glass, however, this is normally only one level of magnification. Another option is a magnifying lamp which can both illuminate the mini and magnify it. Again, these are typically only one level of magnification, but some are adjustable. 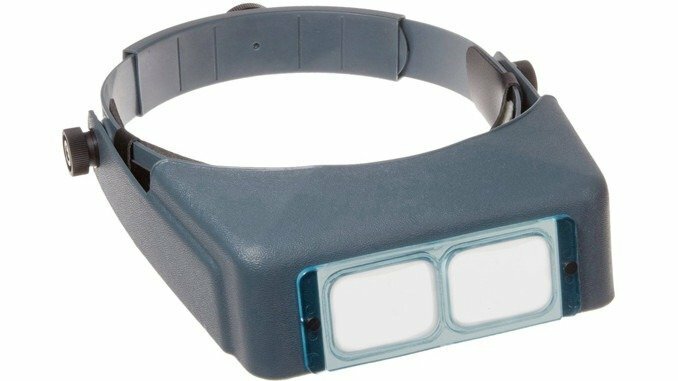 The best option is the head-mounted magnifier with various levels of magnification. There are a number of paint shakers on the market and a number of DIY options you can utilise to keep your paint in the best shape. The first tip I have with paint pots would be to transfer Games Workshop paints to dropper bottles. Or just use a brand that is already in dropper bottles. Whatever you do or don’t do, it’s worth adding an agitator to your paint pots to assist with mixing. 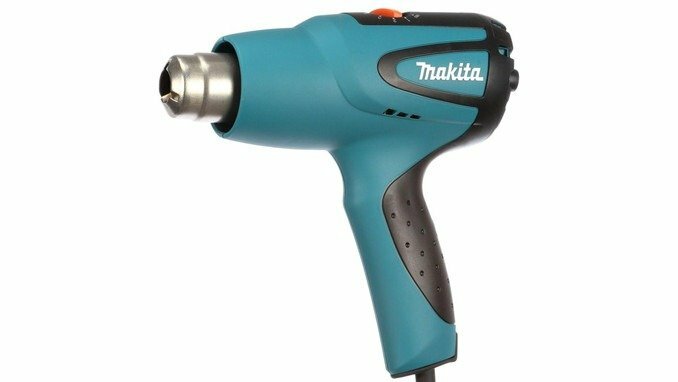 Before making your own DIY paint shaker, please don’t go looking for a way to attach your paint bottles to a drill. I’ve seen so many people do this and that isn’t a mixer, it’s a centrifuge. It will separate the pigment from the medium, not mix it. The correct way to use a spinning device to mix paint is to get something like a drill or Dremel and put a brush end in it. Or you can buy something like the Badger paint mixer. 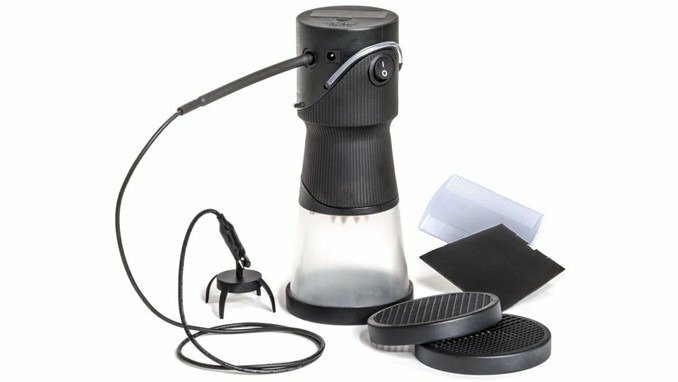 but this is essentially just a Portable Coffee Frother. The best DIY method is attaching a g-clamp to something like a jigsaw. 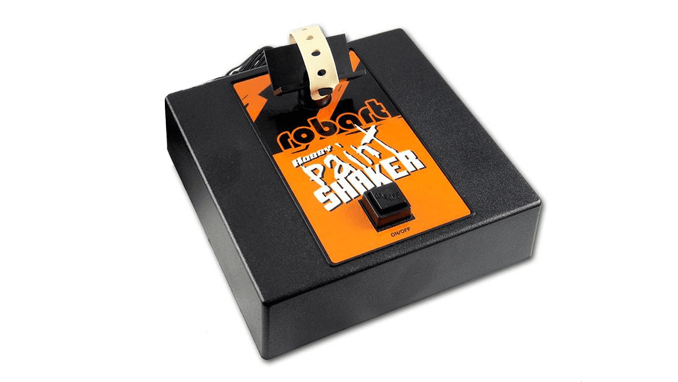 There are some actual paint shakers on the market, the cheapest being a nail polish shaker and the more expensive being the Robart 410 paint Shaker. If you are new to the hobby, you’ll soon start to find that you have many leftover components. parts can be used for later conversions, painting practice or basing materials. Some people sell their leftovers on eBay, after all, one person’s trash is another person’s treasure. Any storage box will fo at first, even the box your models came in. After a while, you’ll build up enough components that you’ll want to start sorting and organising them. 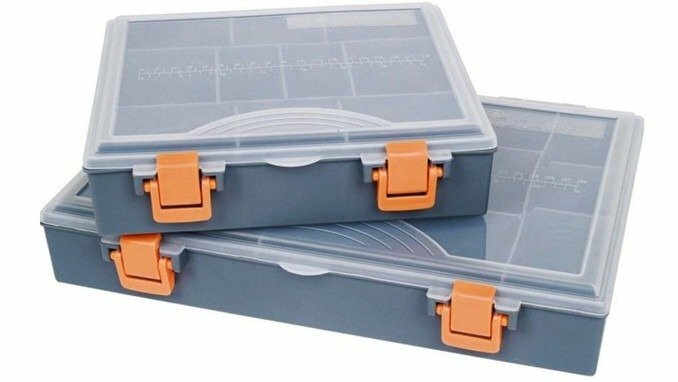 Something like a nuts & bolts storage box or a fishing tackle box. At first, you will probably just use your dining table and some storage boxes. as your models and equipment grow. it becomes more necessary to have somewhere dedicated to your hobby. If for nothing more than to avoid having to pull everything out and put it away every time you want to sit down and do some painting. For desks, it’d down to personal preference, available space and how much you get it in the neck from other people living with you for leaving all of your kit out. The general rule of thumb is to get a large flat surface and get lots of drawers. you can get dedicated hobby desks which fit this requirement. For storage, there are multiple options out there and most of them are variations of either laser cut wood or perspex which slots together to make drawers, paint stands or wall mounts. 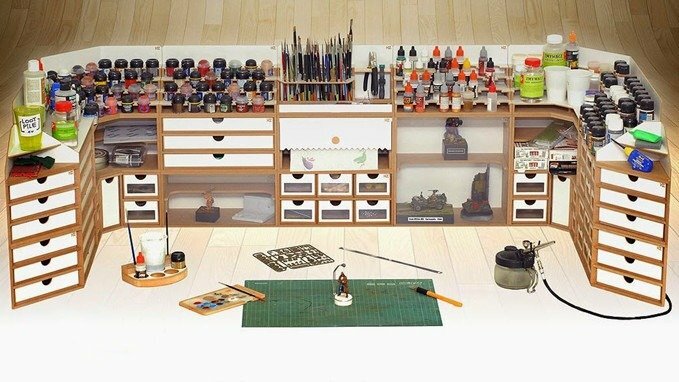 The most coveted set up is the HobbyZone Modular Workshop system which has a series of drawers and racks that you can build in a configuration that fits your space. Check out our reviews of the modules. Super glue is super, but for some, it can still take some time to dry and the bond isn’t naturally as strong as it can be. 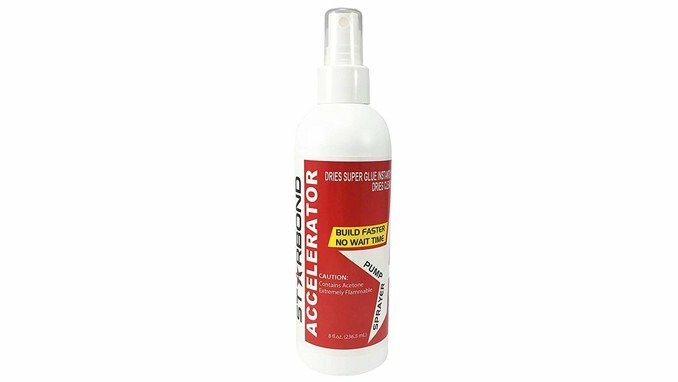 A super glue activator is simple, it will cause the glue to instantly cure and the bond will be much stronger than without it. Not the most necessary tool, but definitely useful for larger metal and resin models. Throughout your hobbying, you are likely to get paint and glue all over your fingers. Especially now it has become quite fashionable to use the back of your hand or thumb-nail as a sub-palette. You could always use latex or nitrile gloves to avoid this. But if you prefer the tactile feedback of using your fingers directly, getting paint or glue on them is unavoidable. The most marketable product you can use is nail polish remover. its acetone based and will take both paint and glue off your fingers. Personally, I steal a pot from my wife that has acetone soaked sponge in it. you just did a finger in and swirl it around until it’s clean. If you are buying a paint stripping product for miniatures themselves. I’ve said it before and I’ll keep saying it. the product you want is isopropanol, aka, isopropyl alcohol or IPA. 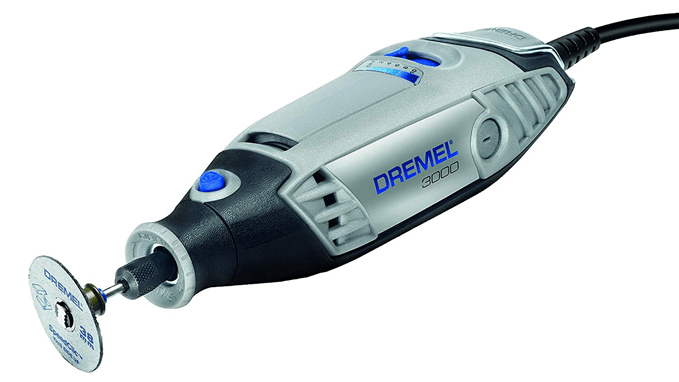 A Dremel or any other rotary tool for that matter is generally just a great tool to own. Not just for miniatures but jobs around the house too. But for the sake of this article, let’s stick to miniatures. It slices, it dices. But wait there’s more. It also works as a sanding tool, a polishing tool, a cutting tool and my personal favourite, a paint mixing tool. For most cutting jobs that you would use a hobby saw for, this will greatly reduce the time and effort needed. The same with a pin vise, the Dremel will drill much faster, which is almost necessary for metal models, many of which will need pinning in order for parts to stay securely affixed. If you have any old paint that’s dried out, just add a brush end to it and stick it in the pot to mix it. If you are thinking of picking one up, I highly recommend a wired one over a battery powered model. not that it spins faster. if you spin it too fast it can melt plastic minis instead of drilling or cutting. but the wired models have more torque, meaning they won’t get stuck in the middle of a cut. Not the most necessary instrument unless you are converting miniatures, sawing up scenery components or removing the large blocks of resin that come attached to resin miniatures. When it comes to cutting through Resin, a hobby knife will not do the job, whilst it has a plasticky feel, Resin is a lot stronger than your usual plastic miniatures and needs something like a saw to cut through. It’s a cheap yet indispensable tool when you get deeper into the hobby. Sculpting is not really for everyone, and, for this reason, it goes into its own specialist category. I know many incredible painters who are terrible at sculpting and never do it. I know many incredible sculptors who are terrible at painting. Some are incredible at both (I am so jealous of those people). You can start your journey with a simple metal sculpting toolset. 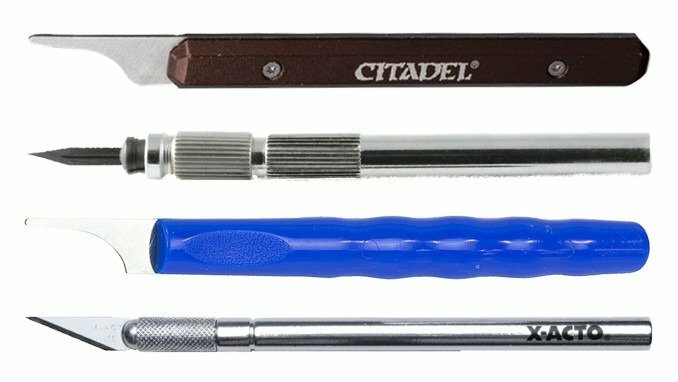 Games Workshop does their own Citadel range of 3 basic tools. Beyond that, a variety of brands make numerous different silicon sculpting toolsets featuring various shapes and sizes for smoothing out and shaping your creations. You can also pick up a set of Sculpting Styluses too for your poking and prodding needs. And that’s the list. What did you think, did I miss anything? Next we’ll take a look at the essential consumables. As You expect there will be some crossover with this article but it’s worth knowing the essential kit you’ll need to have alongside your tools. Great tool summary, especially for someone new to the hobby! Thank you, I’ll be doing a follow up with consumables too.